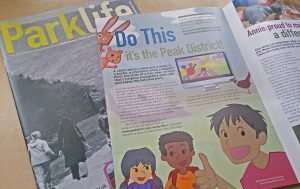 Peak District Animation featured in Derbyshire Times and Park Life | Mair Perkins Ltd.
“A new cartoon is helping youngsters understand how to behave in national park countryside to be safe and enjoy their visit. The film was commissioned by the Peak District National Park Authority to help educate young people, aged between 11 and 25, who visit the national park on school visits or with family and friends. The colourful animation and song has been made by film producer Richie Phillips, director and animator Mair Perkins and music producer Ben Haynes. The ‘Do This’ song is sung in a broad accent by Derbyshire singer, Lewis Hall. Groups of young people were involved in creating the script, storyboard, and fun features. The film encourages young people to enjoy the Peak District, but warns of some of the dangers, such as lighting fires and dropping litter – it is probably the only animation in circulation featuring a pooping dog, a girl riding a dinosaur, and a newt with a bottle on its head.